NASA has captured a huge solar prominence bursting from the surface of the Sun. The prominence was recorded by the Solar Dynamics Observatory (SDO) satellite on October 25. It stretched out roughly 80,000 miles. The space agency noted it was “about ten times the diameter of Earth,” which is just over 7,900 miles. A solar prominence is a largely unexplained phenomenon—scientists do not know exactly how and why they form. They are seen bursting from the Sun’s surface into the corona, the aura of plasma surrounding our star. They are tethered to the photosphere, which is the outer shell of the Sun and the part that radiates light and heat. The images from the SDO include a picture of Earth to show the vast scale of the prominence. The material in the loop is plasma. Plasma is a hot gas made up of electrically charged hydrogen and helium that moves along the magnetic fields generated by the Sun. When a structure on the Sun becomes unstable, the plasma is released, bursting outwards. Normally a solar prominence will form over the course of a day. However, there are cases where they persist and can last in the corona for several months. If it breaks apart, a solar prominence can result in a coronal mass ejection, where the hot gas is expelled into the solar system. Solar prominences tend to stretch tens of thousands of miles into space. However, the biggest eruptions can be far larger. 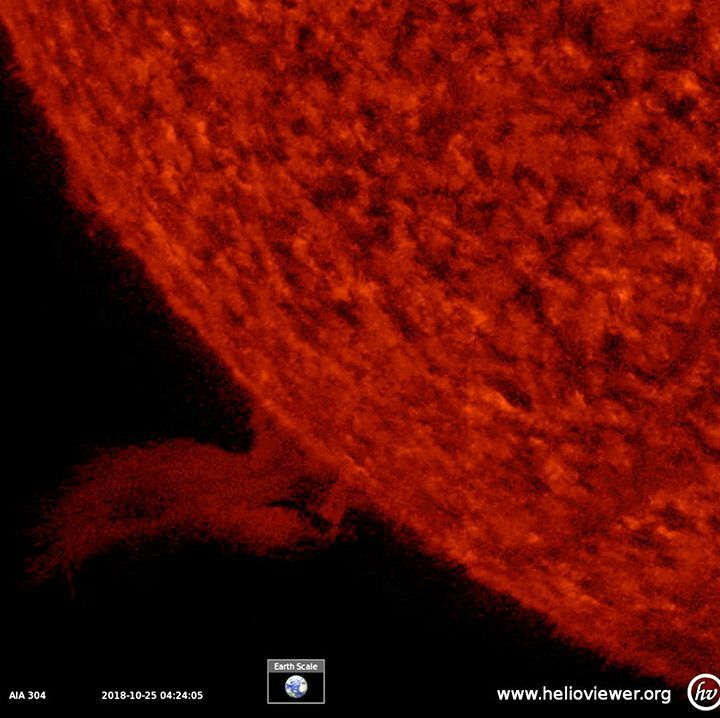 According to Universe Today, a prominence recorded in August 2012 was 500,000 miles long. Even though humans have been studying the Sun for thousands of years, there are still many aspects of it we do not understand. For example, we don’t really know why the corona is so much hotter than the Sun’s surface, and we don’t know why sunspots form. To try to answer some of these questions, NASA launched the Parker Solar Probe—a spacecraft that will “touch the Sun.” In October, the space agency confirmed the probe had become the closest manmade object to the Sun, having traveled within 26.55 million miles of the solar surface. At its closest approach, the spacecraft will be just 3.8 million miles from the Sun.